A collection of featured articles I've written for art publications. This year's edition of the Venice Biennale was a momentous one for the African art scene with an impressive range of artists presented. Ten countries exhibited over 27 artists with works of sculpture, installations, paintings, film and performance. Sharon Obuobi shares her highlights of the best African art on display at the Biennale. The 2016 Armory Show is in full swing, and this year’s Focus section offers an insightful look at contemporary African art. In alignment with the focus on contemporary African art, fair organizers appointed Kapwani Kiwanga as this year’s Armory Artist Commission. Zina Saro-Wiwa is a British-Nigerian artist and filmmaker whose body of work includes video installations, experimental films, and documentaries. Zina Saro-Wiwa spoke with me about her process in developing new work, the gallery she founded in Port Harcourt, and the importance of art on the Niger Delta region. Over its 20-year history the biennale has played a role in the increased visibility of African artists... 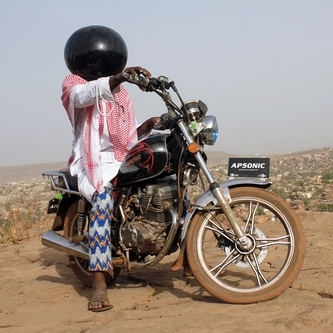 I spoke with Artistic Director Bisi Silva, Director of the Centre for Contemporary Art (CCA), Lagos, about the direction she took Bamako Encounters’ anniversary edition, Telling Time. Wander into the British Museum’s Great Court these days, and you’ll encounter two large, black and gold Moko Jumbie sculptures guarding the staircases on either side. Balancing on seven-meter high (approx. 23 feet) golden stilts, these dark figures resemble wasps with outstretched, upright eagle wings. Two years after Egypt experienced a much internationally publicized political uprising, the country is still experiencing the aftermath since the upheaval of former President Hosni Mubarak's regime. While these dramatic changes have been at the forefront of media attention, a different yet parallel movement has been taking places on the streets. Artists have adopted graffiti to speak out about the current political situation. Nigerian curator Okwui Enwezor presents Rise and Fall of Apartheid, a photo-art exhibition, which explores the influence of the apartheid on South African identity, the civil rights struggle, and the rise of Nelson Mandela. Rise and Fall of Apartheid suggests that modern South African photography is the result of the photography that emerged in 1948 amidst the rise and institutionalization of the apartheid. Ancient Games In A Modern World: African games invented many years ago in traditional societies can still play a vital role in modern society. The nostalgia of past African lifestyles for older generations often includes memories of the unique indigenous games they played as children. If you and I ever discussed such games in person, I would always confidently proclaim that I was (and still am) an undefeated champion in ampe, oware and ludo. Despite the clearly imminent defeat on any challenger’s part, we would be engaging in activities that were designed to build values of fair competition, teamwork, and critical thinking. The Impact of Cultural Arts: A conversation with che kothari, one of Toronto’s most visible leaders in the art scene. che was expected to take on his father’s work.